(Nanowerk News) Surface characterization is important for determining how materials interact with their environment. Researchers rely on their understanding of how surfaces behave in order to improve the performance of materials being incorporated in sensors. 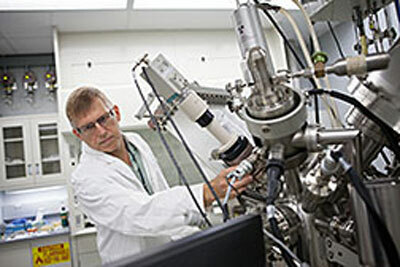 DOE's National Energy Technology Laboratory is developing optical gas sensors, capable of operating in harsh environments, which can be used to monitor and control critical processes in a variety of energy systems including coal gasification, solid oxide fuel cells, gas turbines, and oxy-fuel combustion. For example, using optical gas sensors to monitor and adjust the gas environment during coal combustion or gasification can enable more efficient coal utilization and improved power plant efficiency. Using X-ray photoelectron spectroscopy (XPS)—a technique used to examine the surface chemistry of a solid material—NETL researchers have begun to understand the operating principles and sensing mechanisms behind promising nanocomposite thin film materials. John Baltrus uses X-ray photoelectron spectroscopy to analyze a material’s surface chemistry. XPS provides information about surface elemental composition as well as the chemical and electronic states of the elements. Elements within the top 3-5 nanometers of the surface of a material emit characteristic electrons when excited by an X-ray beam. The number of electrons having specific energies can be plotted to yield spectra that permit determination of the relationship between electronic properties and surface composition of thin films. Understanding this allows researchers to adjust composition to improve the electronic properties and thus the performance of the sensing films. Using this technique, NETL researchers gained insight into the sensing mechanism associated with yttria-stabilized zirconia (YSZ) nanocomposite films containing noble metal nanoparticles. Gold-containing YSZ thin films demonstrated a sensing mechanism involving the transfer of electrons back and forth between the gold nanoparticles and YSZ in response to experimental variables, including high temperatures and exposure to oxidizing and reducing gases. The effects of changes in electron density of gold can be measured as part of the gas sensing process. By understanding what is responsible for such changes, different noble metals and configurations can be exploited to engineer new and better surface materials for use in optical gas sensors.